Dhananjayan, Chief of Disney - UTV, South India, has long established himself as one of the top analysts of Tamil Cinema. He has recently voiced his opinion about the current state of cinema, in which many movies are releasing every other week every month, and many more have announced that they are eyeing the December 25th slot. "On 25th December, the following films are lined up as per announcements: Kayal, Isai, Kappal, Enakkul Oruvan, Meagamann, Vellaikkara Durai, Kakki Sattai and Pisasu, on 19th of December. Too many films and too few audience. Tamil cinema urgently needs to slow down & phase out films' release if we have to get the attention of the audience & bring them to theaters. Sad to hear from distributors that last week, out of 6 films, just one is getting the attention of audience & others are biting the dust. Not good. 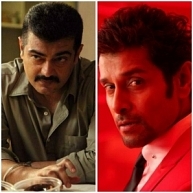 Even the proposed clash for Pongal of 3 films 'I' Vs Yennai Arindhaal Vs Aambala is not good. Maximum 2 will be good to get super collections." A Medieval Poet For Aishwarya R Dhanush's Vai Raja Vai! People looking for online information on Aambala, Enakkul Oruvan, I, Isai, Kakki Sattai, Kappal, Kayal, Meagamann, Pisasu, Vellaikkara Durai, Yennai Arindhaal will find this news story useful.